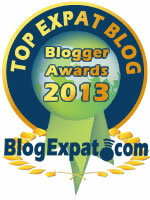 That's right, it's time cast your vote for this blog to be awarded "Top Expat Blog" for 2013! Every quarter, Blog Expat [dot] com will announce which blogs have caught their eye as the best in the field and deserving of a special mention. Their first announcment is coming up next month in March.